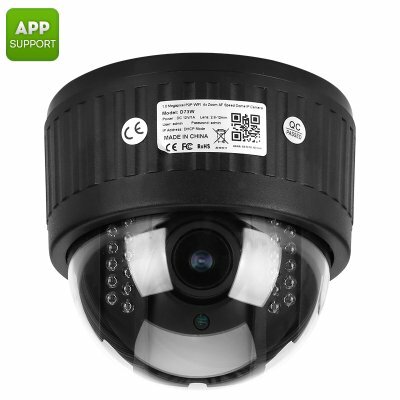 Successfully Added PTZ Security Camera - 1/3 Inch CMOS, 960P, 4x Zoom, Auto Focus Lens, 20m Night Vision, IR Cut, App Support to your Shopping Cart. Keep a careful eye on your property and belongings with this IP camera. Featuring a 1/3 inch CMOS sensor this PTZ camera delivers a clear and high detail image, ensuring that everything that happens around your property will be recorded in 960p HD quality. Its 2.8-12mm lens features a 4x zoom option, allowing you to keep a clear and detailed eye on what’s happening in the distance. With its auto-focus technology, this outdoor IP camera is guaranteed to deliver sharp and recognizable images without exception. Thanks to its Pan-Tilt-Zoom design this IP camera can rotate 355 degrees horizontally and 90 degrees vertically. Along with a 90-degree viewing angle you are guaranteed that not a single movement around your property will stay unnoticed. Allowing you to set up to 4 motion detection areas this PTZ IP Camera is the perfect little gadget that can be used to monitor specific locations such as an entrance and window. Once motion has been detected an automatic alarm notification will be delivered to your e-mail or smartphone - ensuring that no matter where you are, you will always be up to date about the latest security status of your property. This PTZ security camera comes with a 12 months warranty, brought to you by the leader in IP cameras as well as wholesale electronic gadgets..